This arrangement is possible on friday and saturday from 21:00. You must make a reservation for this arrangement. Unlimited lasergaming means you can start shooting from 09:00 pm. Invite your friends, colleagues and/or family and start battling each other. In this game you can earn extra points (in addition to shooting points) by being hit as few as possible. These extra points will enable you to ‘buy’ extra forces such as: immunity, invisibility and spy. If you get hit both lamps on your shoulder will start blinking, meaning: Game over. Experience a fantastic evening on which tactics and fun come first. We reserve 4 laser tag sessions for you. In case you want to play more sessions, you can do so on the basis of availability. A laser tag session can easily be combined with other packages. Upstairs is a restaurant and in the immediate area you can find various activities. 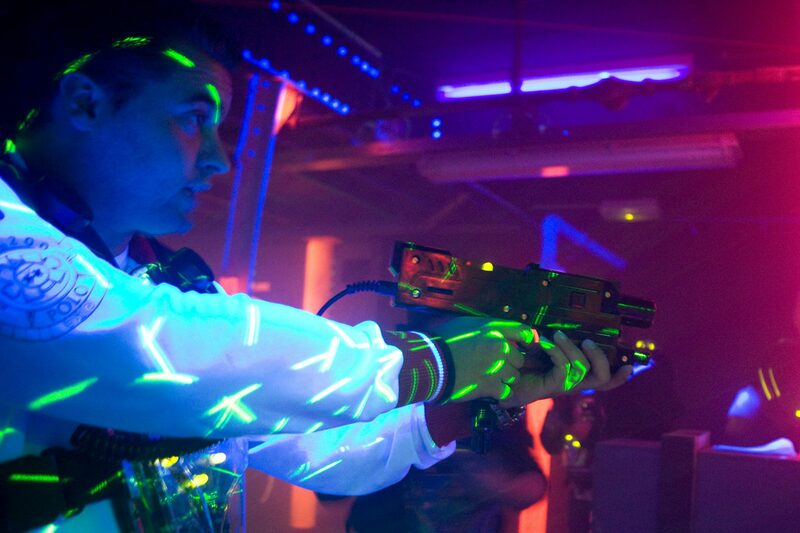 As result, a laser tag session can quickly and easy be extended with another activity, a dinner or a drink. We are happy to help you to find the best outing!